My Irish Great Great Grand-father Frank Lawrence was a milkman who delivered milk to the fine homes of New Orleans during the early 1900’s. At that time there was no widespread use of refrigerators until the late 1920's, although the icebox had been in common use (the ice had to be delivered) from the 1850's on. Milk would be delivered every day, except Sunday. Each day, my Grandfather milked his dairy cows early, around 3:00-4:00 am. Then Grandpa Frank loaded his supply into a small wooden buggy, pulled by his horse. He would then make his way along his route, knocking on his customers' doors. The lady of the house would come to the door bringing whatever container she kept the family's milk in and Frank would take his ladle and scoop out the amount of milk she had ordered. Then he would go to the next home. 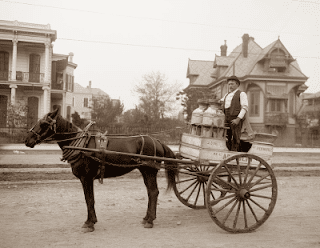 One day Frank wasn’t feeling well, so he asked his neighbor Joseph to run his route and deliver the milk. Joseph said I will help you, but I don’t know your route. Frank replied don’t you worry the horse knows the way. The neighbor wasn't too confident in that ole horse, but to his surprise as soon as he flipped the reigns, the horse started along his way. 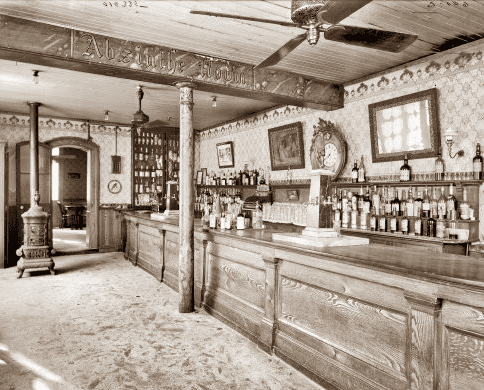 Each time the horse stopped in front of a house, a customer would meet him at the door with a container to be filled with milk.The route went smoothly all morning and into the afternoon until the horse stopped in front of a bar. Joseph was a little confused but he had learned to trust the horse. He jumped off the wagon and went inside and asked the bartender how much milk did he need? The bartender looked at him like he was crazy for a moment then he answered don’t you know that this is a bar? Joseph replied, I’m filling in on this milk route and the feller that owns the wagon told me that the horse knows the stops and sure enough he hasn’t been wrong until now. The bartender looked out to the street at the horse and started laughing. That’s old Frank Lawrence’s horse. Frank stops by and has him a cold beer every afternoon . I can relate to this as my Grandfather came from Ireland in 1899. 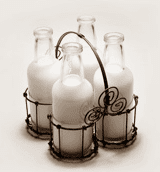 Our family had a dairy and we would help Dad deliver milk on days off from school. Somehow I've seen the horse stopping at a bar in a joke before. My grandmother recently told me this story. It was told to her by her mother when she was a little girl back in the 1930's.